Welcome! We are Mueller Environmental & Home Inspection, Inc., Western North Carolina’s premier resource for residential and commercial environmental inspection, testing, and remediation services. We offer a full range of inspection and testing services with specialization in mold inspection and remediation services in the Asheville and surrounding areas. We are committed to providing our clients with the best value in personalized, professional service. Buying a house and want peace of mind? Concerned about air quality in your home? Experiencing mold growth or musty odors? Receiving complaints from employees or tenants experiencing symptoms of exposure? 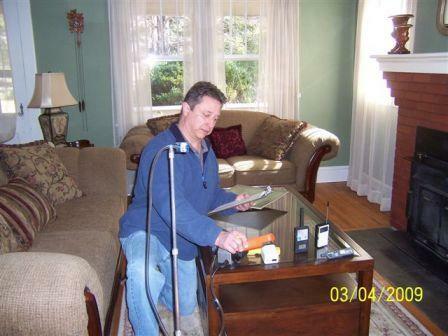 John Mueller conducts an indoor air quality assessment using a variety of equipment and sampling techniques to identify contaminants.​ Hidden mold growth in wall and ceiling cavities can be detected, identified, and quantified by pulling air samples through electrical fixture mounting boxes or receptacle boxes.